Are you called to be a deacon? To help answer to the question, the Archdiocese of Philadelphia will sponsor an Information Night on the permanent diaconate on Thursday, April 21 at St. Charles Borromeo Seminary for men between the ages of 29 and 55 who believe that they may be called to ordained ministry. The program begins at 7 p.m. in Vianney Auditorium at the seminary, 100 East Wynnewood Road, Wynnewood. To register or for more information, contact Laura Nimmons at lnimmons@archphila.org. If men interested in the Information Night are married, they must attend with their wives. The application process for the permanent diaconate takes approximately one year, and for those admitted, formation at the seminary involves six years of study. Classes are held one to two nights per week and follow a college semester calendar. In addition, there are workshops on approximately eight Saturdays spread throughout the academic year and a weekend retreat is required each summer. If married, it is the reasonable expectation that a candidate’s wife will attend as many classes and functions with her husband as possible. A deacon is an ordained member of the clergy in the Catholic Church, who is called to be a minister of the Word, a minister at the altar, and a minister of charity. While all baptized persons are called to share in the mission of Jesus Christ according to the gifts of the Holy Spirit, a permanent deacon, who may be married, is a member of the clergy and shares in the hierarchy of the sacrament of holy orders. A deacon’s ministry entails proclaiming, preaching and teaching God’s Word, assisting the bishop and priest at the liturgy, assisting at funerals, ministering to the sick and dying, leading the community in prayer and in sacramental liturgies, baptizing, witnessing marriages and exercising administrative leadership in the church. 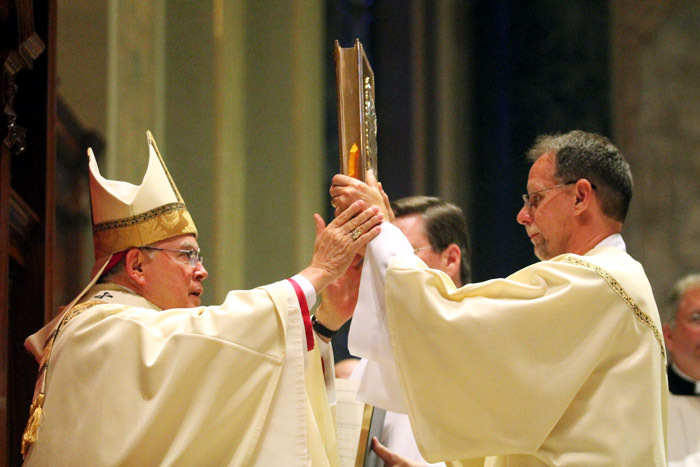 A deacon is a witness to his office in a permanent, public and prominent way. When serving at the altar, a deacon is vested in an alb, stole and dalmatic. When engaging in ministry in the community, he dresses in clerical attire, but he wears a gray clerical shirt with a Roman collar, instead of the black shirt worn by priests and bishops. Through the sacrament of holy orders, the deacon is configured to Christ the Servant, who acts through the ministry of the deacon.